A few weeks ago, Olympiad Tom Daley shocked the world via an Instagram post – not because of his abs, but his frying pan. Excuse us, while we swoon. 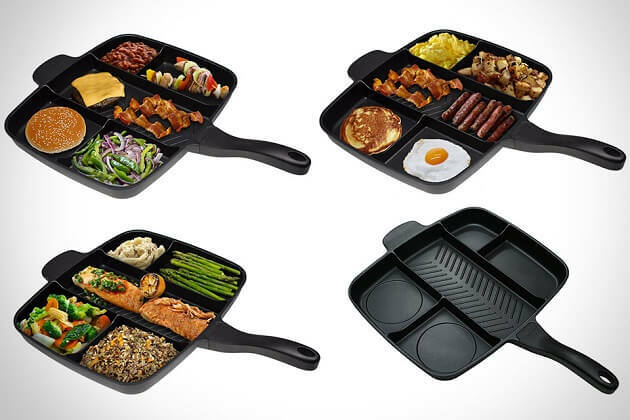 The versatile utensil, aptly named the Master Pan, has taken the world by storm, with both its simplicity and its brilliance. The frying pan of the hour boasts a 12 x 15 inch (32 X 38 cm) aluminium non-stick base, an ergonomic bakelite handle oven safe up to 180C (350F), double layer non-stick coating and a heavy gauge base for a balance heat flow. It's designed in such a way to vary the heat on the surface of the pan, as to avoid burning lighter items and allowing for a full meal to be cooked at once, perfectly. The higher heat in the centre is for grilling meats and fish while the lower heat on the sides is for frying lighter foods such as eggs, vegetables and pancakes. So basically, yes, this utensil is doing God's work. HOW have you gone this long without one? !